Get superior non-turbulent grit dewatering, optimized for fine wastewater grit. The Grit Snail® is a quiescent dewatering belt escalator that captures and dewaters the fine grit output from a HeadCell®, SlurryCup™ or TeaCup® grit removal system. Providing solids output with low water content, the Grit Snail® reduces solids handling and landfill costs. Designed to handle very fine grit, the slow-moving belt pulls solids from clarifier water without agitating the water, thereby retaining even very fine particles. Designed to handle very fine grit, the slow-moving belt pulls solids from clarifier water without agitating the water, thereby retaining even very fine particles. The belt operates within an abrasion-resistant belt housing and incorporates components with no metal-to-metal contact, in order to reduce wear. The variable frequency drive adjusts belt speed to match changing grit loads and the torque-limiting clutch protects the drive system and belt from mechanical overload. Municipal wastewater plants with combined sewers or industrial loads require greater dewatering capacity; different sizes of Grit Snail® units or multiple Grit Snail® units can be configured to match any grit load. Watch a brief video demonstrating the Grit Snail® here. Download the Grit Snail® brochure here. 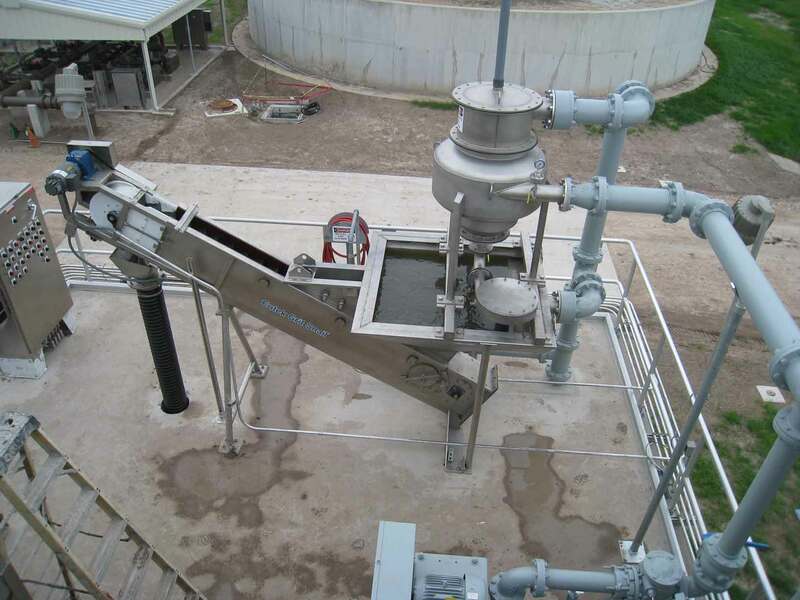 Download the white paper “How to design a grit removal system that really works” to find out what you need to know about wastewater grit removal system design. 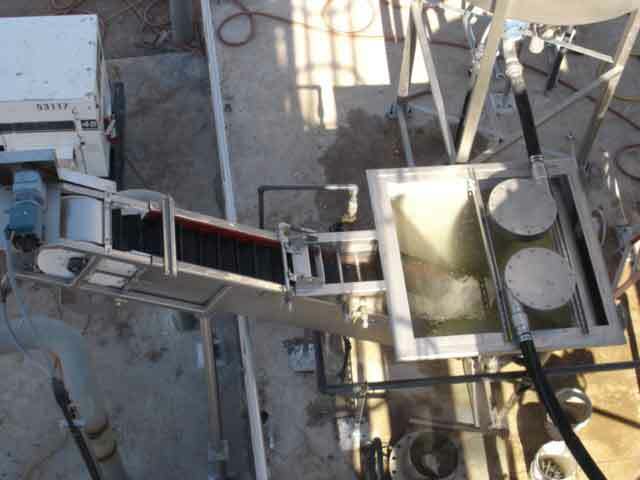 Many conventional grit removal systems will combine washing and dewatering into a single process. Washing is a turbulent process, however, and dewatering should be performed under still conditions; combing these processes is why many types of systems fail to retain fine grit. The Grit Snail® is a quiescent system with a slow-moving belt that eliminates this kind of turbulence, meaning that it retains more, finer particles. When matched with a Hydro International separation and/or washing system such as the HeadCell®, SlurryCup™ or TeaCup®, the Grit Snail® retains fine grit and outputs material with very low volatile solids or residual moisture, cutting odor and making the output easier to handle and dispose of. Your treatment plant is the best way to treat water and organics - avoid paying the expense of landfilling water and organic content. Grit and fine abrasives are discharged by a grit washing unit into the Grit Snail® clarifier, where they settle onto the slow-moving stepped cleats. The captured solids are gently lifted out of the clarifier at between 1 and 5 feet per minute. Degritted water flows out of the clarifier via an overflow weir. Dewatering begins as the grit and fine abrasives are quiescently raised from the clarifier pool to retain fine grit. The dewatered abrasives are carried to the top of the Grit Snail®, where they are discharged into a disposal container for landfilling. The slow-moving cleated belt gently escalates the grit from the clarifier, retaining fine grit, unlike turbulent dewatering systems which reintroduce captured grit back into the plant. The Grit Snail® is designed for durability and ease of maintenance, resulting in a very long product life and trouble-free operation. Belt widths range from 6" to 57.5"
Grit causes major and expensive problems for wastewater treatment plants. Download our free calculator to discover how much your grit could be costing you. A.Larger plants will typically require a Grit Snail® system, while in many smaller plants a Grit Decanter system will provide the required dewatering performance more economically. Please contact us to determine whether a Grit Snail® or Grit Decanter dewatering system would be the optimal choice for your plant. A.No, the Grit Snail is designed specifically for dewatering clean grit output from Hydro International’s high performance separation and washing devices. Other systems will output grit with high organic content and cannot be dewatered by a Grit Snail. Alternatively, systems may not capture the fine grit particles that the Grit Snail is designed to retain – and would not require the performance of the Grit Snail. A.Many conventional dewatering systems combine washing and dewatering in the same process. This introduces turbulence, which stirs up the captured fine grit particles, allowing them to be released with the effluent water. The slowly moving belt of the Grit Snail® pulls solids from the clarifier water without agitating the water, thereby retaining even very fine grit particles. Total Dynamic Head (TDH) is site specific, but you can use this guide to estimate TDH for Hydro grit removal applications. Additional details on the operation and configuration of Grit Snail systems. 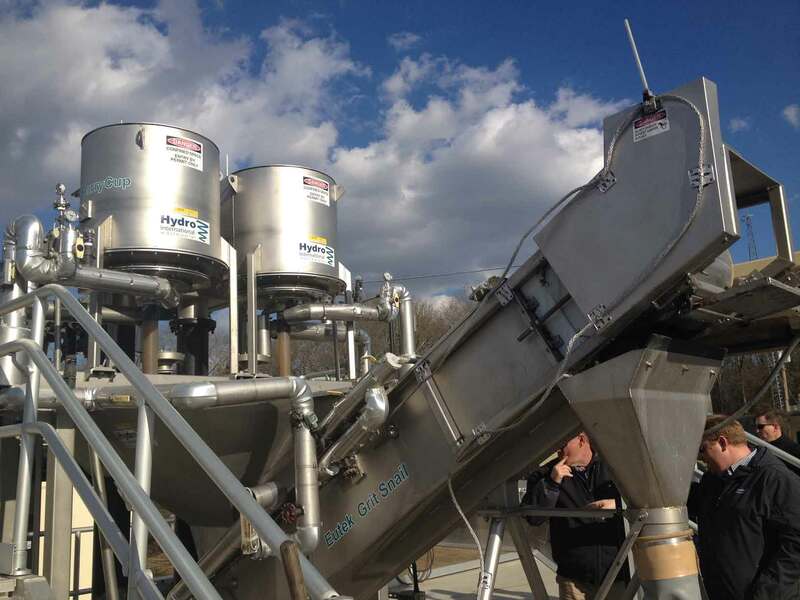 Two HeadCell® advanced grit separation systems were installed, each followed by a SlurryCup™ washing system and Grit Snail® dewatering system. This system removed much finer grit as well as reducing organics in the output grit. A HeadCell® / TeaCup® / Decanter system was selected to protect the plant from the impacts of grit.